MWC Barcelona, the largest mobile event in the world, brings together the latest innovations and leading-edge technologies from more than 2,400 leading companies and visionaries to explore the hottest topics influencing the industry. The theme of this year`s event is `Intelligent Connectivity`, the powerful combination of flexible, high-speed 5G networks, the Internet of Things (IoT), Artificial Intelligence (AI) and Big Data. WISeKey`s booth will be located in the Swiss Pavilion (https://www.s-ge.com/en/event/swiss-pavilion/swiss-pavilion-mobile-world-congress - Hall 8.1 Stand 8.1D60) where the WISePhone Genesis, the entry-level model of the family of WISePhones, will be showcased. WISePhone Genesis delivers business and personal privacy and security to secure the infrastructure of 5G networks, the underlying layer of the new connected world. WISePhone is a cost-effective and flexible mobile phone and platform that empowers efficiency and mobility whilst protecting personal data and digital identities by transforming public networks and mobile devices into highly secure communication channels. WISeKey`s Root of Trust (RoT) and highly secured IoT technologies are essential tools to secure 5G networks. 5G revolution will transform the way we access information, how we do business and offer a new road map for entirely new business models and even new industries. While 5G will bring new opportunities and rapid change, security and trust need to be embedded on the infrastructure. Through a Personal Cybersecurity Hub, WISePhone Genesis model puts users in control of application permissions and offers separate secure environments to protect and separate personal and business data. Additionally, WISePhone`s suite of applications offer voice and text encrypted communication features (WISeTalk), due to sophisticated security mechanisms and advanced end-to-end encryption technologies. Furthermore, WISeID keeps users` data and digital assets protected inside an encrypted enclave (replicated in a secure swiss cloud), while WISeAccess provides additional secure authentication factors to access the WISePhone suite of applications. "Through WISePhone, users are in control of their identity and data, instead of the service providers. 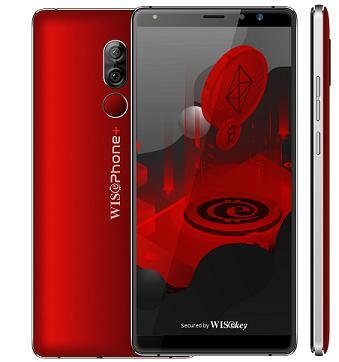 Essentially, WISePhone is an Android phone like any other with all the same functionalities, but it has an additional locked area that is protected from security issues. This unique feature allows users to securely hold cryptocurrency or other crypto assets like non-fungible tokens, and also secure email and voice exchanges. It`s a unique concept that brings over 20-years of WISeKey`s cybersecurity and IoT experience into one phone," said Carlos Moreira, CEO of WISeKey. Since 2010, WISePhone.ch voice encryption products and services have been used by large user groups in public and private organizations and recently, the technology was upgraded to provide voice encryption services for a wider consumer platform, targeting global markets. Today, the platform hosted in Switzerland inside WISeKey`s zero-risk bunker deep in the Swiss Alps, provides Secure Cloud Storage solutions allowing users to securely exchange sensitive data and Identity Management with WISeID. WISeKey (SIX Swiss Exchange: WIHN) is a leading global cybersecurity company currently deploying large scale digital identity ecosystems for people and objects using Blockchain, AI and IoT respecting the Human as the Fulcrum of the Internet. WISeKey Semiconductors secure the pervasive computing shaping today`s Internet of Everything. WISeKey has an installed base of over 1 billion microchips in virtually all IoT sectors (connected cars, smart cities, drones, agricultural sensors, anti-counterfeiting, smart lighting, servers, computers, mobile phones, crypto tokens etc.). WISeKey is uniquely positioned to be at the edge of IoT as our semiconductors secure a huge amount of Big Data that, when analyzed with Artificial Intelligence (AI), can help industrial applications to predict the failure of their equipment before it happens. Our technology, trusted by the OISTE/WISeKey`s Swiss based cryptographic Root of Trust ("RoT") provides secure authentication and identification, in both physical and virtual environments, for the Internet of Things, Blockchain and Artificial Intelligence. The WISeKey RoT serves as a common trust anchor to ensure the integrity of online transactions among objects and between objects and people. For more information, visit www.wisekey.com.